One of the most explosive movie musicals in recent memory bursts onto the live stage with exhilarating results. When Ren (Jeffrey Sabino) and his mother (Rosalind Smith) move from Chicago to a small farming town, Ren is prepared for the inevitable adjustment period at his new high school. What he isn't prepared for are the rigorous local edicts, including a ban on dancing instituted by the local preacher (Patrick Guzman), determined to exercise the control over the town's youth that he cannot command in his own home. When the reverend's rebellious daughter (Kristina Agoncillo) sets her sights on Ren, her roughneck boyfriend tries to sabotage Ren's reputation, with many of the locals eager to believe the worst about the new kid. The heartfelt story that emerges is of a father longing for the son he lost and of a young man aching for the father who walked out on him. To the rockin' rhythm of its Oscar and Tony-nominated top 40 score (the soundtrack album reached number one on the Billboard charts and has sold over 15 million copies!) 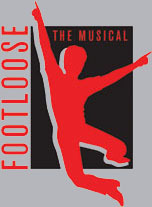 and augmented with dynamic new songs for the stage musical, FOOTLOOSE celebrates the wisdom of listening to young people, guiding them with a warm heart and an open mind.